The pathway to bringing laboratory discoveries to market is poorly understood and generally new to many academics. 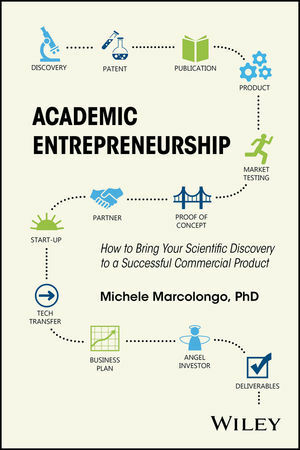 This book serves as an easy-to-read roadmap for translating technology to a product launch – guiding university faculty and graduate students on launching a start-up company. MICHELE MARCOLONGO, PhD, is Department Head and Professor of Materials Science and Engineering at Drexel University and has a laboratory focus in biomaterials. In a past position as Senior Associate Vice Provost for Translational Research, she worked to translate research discoveries from the laboratory toward commercialization and served on the Operations Boards of the Nanotechnology Institute and the Energy Commercialization Institute. Dr. Marcolongo has co-founded two companies in the field of medical devices.